Horace Dediu has been writing an important series on Apple and Samsung capital structure. 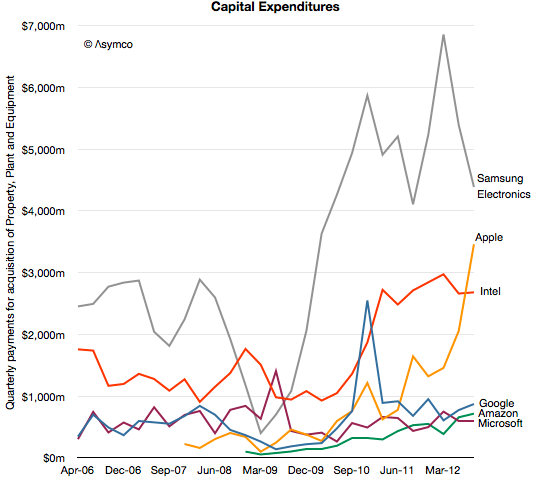 In his 12 Dec 2012 post Horace compares 2006 – 2012 capital expenditures. In the post reviewing Samsung’s Capital Structure I noted that its component divisions have historically taken 90% of capital investments and that the overall capital intensity for Samsung Electronics has increased in proportion to its component revenues. In another post regarding the capital structures of other technology companies with different business models I noted that Apple has changed its capital structure to a significant degree over the previous three years. In the following graph I combined these observations to show how capital expenditure patterns may be used to discern the underlying business model. That’s just a teaser tidbit. So go straight to the source for the Asymco analysis. There is a lot going on here that is not obvious. I consider this extraordinary evidence of an extraordinary shift in strategy. So what tale does this capital tell? This entry was posted in Apple, Technology by Steve Darden. Bookmark the permalink.